We arrive at the Renaissance Hotel early. Entry only required an online reservation so I don’t mind waiting in a brief line. I’ll gladly exchange a little time for an opportunity to see Cut Copy for free. We receive wrist bands and a complementary Renaissance Hotel portable battery pack with a forgivably useless micro-USB cable. Never look a gift charger in the cable, that’s what I always say. We ascend two flights of escalators and enter a ballroom. We receive a card informing us of the proper profiles and hashtags for the event. There is soft purple and green up-lighting and stations around the back of the room with large glowing white signs that read ‘SHOP’, ‘SIP’, ‘SEE’, and ‘SAVOR’. Women in black dresses and men in black suits bustle around the room. The beer line is long and slow. There is no line for the free artisanal pizza. I start to soak in the rest of the room. Designer hand bags are on sale at a pop up shop in one corner. There are free chicken wings and donuts in another. No one is standing within 50 feet of the stage at the far end of the room. I realize I am standing on carpet for the first time at a concert and I arrive at a strange conclusion: this is the most glamorous concert I’ve ever attended and it’s super weird. The crowd is a weird mix of hipsters, fashionistas and actual adults, likely lured in by the promise of free food and music. I swear to you, I saw a dude from Project Runway and at least one real housewife of somewhere. I eat a frosted donut that tastes like a waffle with some chicken wings and my life is changed. I sample local beer and wine. I still can’t believe I’m standing on carpet. I feel like I’m at a wedding reception designed to sell me something fancy. Cut Copy takes the little stage just after 9PM and finish almost exactly an hour later. The ballroom is still mostly empty but it gives us room to dance. There are no lasers but it’s a free show so I can’t complain. The mood lightens as the band gains momentum. 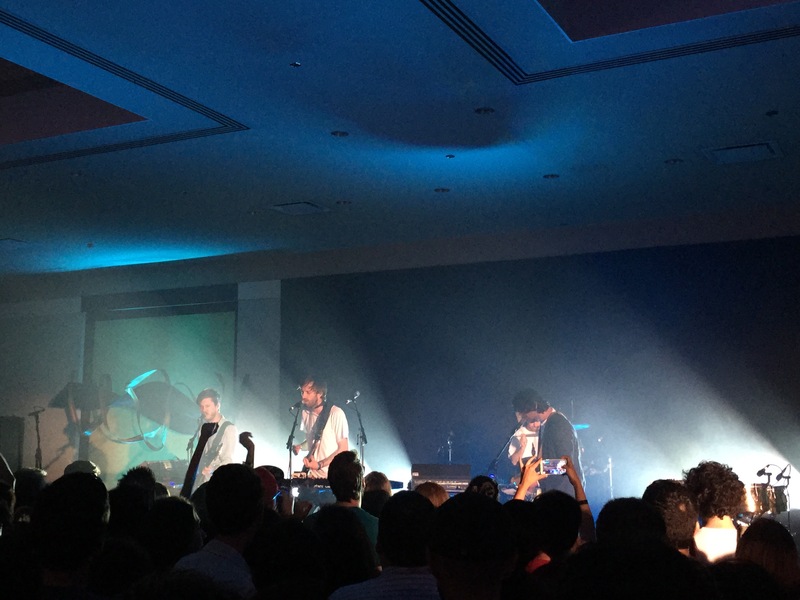 When Cut Copy plays “Hearts On Fire” about 20 minutes in, the room shakes free from pretense and the party peaks. A little raver girl spills her drink onto my back but I’m a chill dude at a free concert so I let is slide. Lead singer Dan Whitford jokes in an Australian accent about the ‘hotel party’ vibe and despite having played massive festival sets around the world, the strange setting and small crowd doesn’t seem to bother him. They charge through “Take Me Over”, “Let Me Show You Love”, “Where I’m Going”, “Need You Know” and return for a brief encore, culminating with “Lights & Music”. I jump around, sing along and dance with unabashed glee to Cut Copy’s joyful electric tunes. The show ends, the crowd scatters into the night and so ends the best/weirdest/most glamorous free concert I’ve ever attended.